Despite its film industry being over a century old, film education and film schools have never been widespread phenomena in Japan. Mostly restricted to small private operations, the few that manage to survive mainly cater to people wishing to enter the world of television broadcasting. 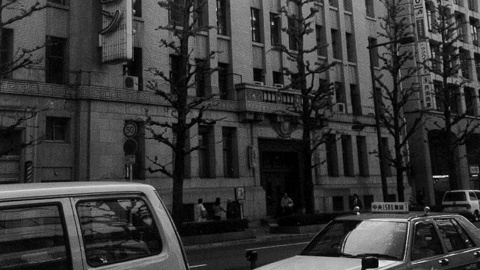 The Film School of Tokyo, or Eiga Bigakko as it's known in Japan, is a unique institution in that it focuses exclusively on filmmaking. Despite being a small organisation, it has managed to secure the talents of some of the most important contemporary filmmakers in the country as its teachers and lecturers. People like Kiyoshi Kurosawa, Shinji Aoyama, Makoto Shinozaki and Hirokazu Kore-Eda spend their time between films in front of the blackboard in Tokyo's Kyobashi area, where the school is based. School president Masamichi Matsumoto, also program director of exhibitor Athen&eacut;e Français, and Hiroko Matsuda, former editor-in-chief of cinema magazine Switch and producer of Makoto Shinozaki's Okaeri, talk to Midnight Eye about The Film School of Tokyo. "The Film School of Tokyo is a joint project by Euro Space and Athen&eacut;e Français," president Masamichi Matsumoto explains. "Because of this, the school also has two presidents, myself and mister Kenzo Horikoshi of EuroSpace. The two companies used to form a kind of cinema club, and they both screened films for the public. EuroSpace had its own theatre and moved into distribution and production later on. In 1994 the two companies co-produced Daniel Schmid's film The Written Face, which was shot in Japan and used many Japanese actors and staff. From that experience came the realisation that in order to find and create new talent in Japan it would be necessary to start something along the lines of a film school." "We want to keep the industry healthy," Matsumoto continues, "For example directors like Kiyoshi Kurosawa, Shinji Aoyama or Akihiko Shiota, they were cinema lovers long before they became directors. They often came to see films at EuroSpace or Athen&eacut;e Français. It was a long road for them to becoming directors and finding the budgets to enable them to make their films. Having a school like this might help change this situation for young filmmakers starting out now." The school's curriculum is split into two main filmmaking courses: a fiction course and a documentary course. "In fiction we have teachers like Kiyoshi Kurosawa, Shinji Aoyama, Makoto Shinozaki and Akihiko Shiota. For the documentary course, the teachers are Hirokazu Kore-eda and Nobuhiro Suwa. The two courses are separate at the moment. Students can do either documentary or fiction, but I feel this is only the beginning. We are thinking about the possibility of changing this, since we're increasingly seeing the borders between fiction and documentary disappear in professional filmmaking. We think it's very important for the students to have the opportunity to study both forms. In cinema history, fiction films have adopted documentary elements on numerous occasions, which often meant the start of a very creative period in cinema history. So it's very important that students are given the opportunity to study both." In what is probably a unique form of hands-on cinema education, the Film School of Tokyo has so far produced three feature films on which most positions behind the camera were occupied by the students. In 1999 they worked on Barren Illusion (Oinaru Genei) under the guidance of Kiyoshi Kurosawa and on Don't Look Back (Dokomademo Iko), helmed by Akihiko Shiota. The most recent of these projects so far is Acacia Walk (Akashia No Michi), directed by Joji Matsuoka. To the great pleasure of everyone at the school, the three features have gone on to tour the international festival circuit, snapping up a number of prizes along the way. Hiroko Matsuda served as producer on all three films. According to her, the creative process was also incorporated into the courses: "All three films originated with the directors themselves. In the case of Barren Illusion, the original idea came from mister Kurosawa but he developed the storyline in his classes with the students and wrote the screenplay accordingly, so the students had a big hand in the writing. Many of them also appeared in the film as actors." Matsumoto adds: "Barren Illusion was our first attempt at making a film with the students as crew. The film was not very profitable. It didn't lose money, but it wasn't very profitable. A student crew is not as good or as experienced as a professional crew. They need more time and more guidance, so their low cost doesn't make the film any more profitable. Our school wants to erase the borders between students and professionals. It's good for the students to work with professionals and to work as professionals." In addition to the fiction and documentary courses, the school has recently started a subtitling course, which focuses on subtitling foreign films for Japanese release. "It's not only the subtitles that are important, but also for instance the accompanying documents and information that go with the film. They should be translated into proper English. When foreign journalists want to see a director's previous films or want to know more about a film, it often happens that there are no subtitled versions or there is no information available in English." Has Matsumoto ever considered subtitling Japanese films into foreign languages, with the aim of supporting Japanese cinema's chances abroad? "That's a very good idea. We've never thought about that, actually. Finding a suitable teacher for it will be difficult, though, but it would certainly be a tool to promote Japanese film. It's possible to receive some money from the government to subtitle a Japanese film for foreign release or festival screenings. Often though, this comes with restrictions, like having to present the film at certain festivals in a competition and nowhere else." With that in mind, what is Matsumoto's general feeling about the Japanese government's attitude toward the film industry? "I think in reality the budget the government has for supporting filmmaking is not so small at all," he reveals, "but this money doesn't reach the independent directors who really need it. There are government bodies that give grants, but maybe the money only goes to major studios. I'm not sure about the exact situation and I feel it needs to be researched more, but I have the feeling there is quite a lot of government money for the support of filmmaking. Just to be clear, there is not one single government body which has all the money, like the BFI in England. We have to ask for funding from different sections. If we all keep asking the government, then maybe they will create that single organization." He continues: "However, in order to get this money we need to follow certain guidelines and present the required documents to these organizations. So for independent directors or producers it's necessary to study the process and the guidelines. We have a special section here at the school focusing on production, where people like mister Horikoshi of EuroSpace teach classes on finding the budget for a film. We also want to ask Takenori Sento of Suncent or entertainment lawyer Atsushi Naito to give guest classes." The film school finds its funding in a number of different ways, including the occasional government grant. "It's basically a completely private school. We've received some government support in the past and we hope to get more of those grants, but in essence this is a private school. In the daytime we rent out our screening room, for instance to distributors who wish to organise a press screening. It's a source of income for us and it's enough to pay the rent for this building. That's the reason why we are located here in the Kyobashi area, since it's very practical for those distributors and journalists." Despite the international renown of its faculty, the Film School of Tokyo has up until now remained an all-Japanese affair, the reason for which is mainly practical. "Some foreign people contacted us already, but the problem is that all our classes are in Japanese," Matsumoto explains. "Of course if someone understands Japanese it's not a problem, but at the moment there are no foreign students, not even foreigners who live in Japan. We only have night courses at the school, so whatever people's situation they can follow the classes. We welcome anyone." Within the current group of students, ages and backgrounds vary widely and only very few have had professional filmmaking experience. "There is one student who worked for the national broadcaster NHK and he came here to study cinema specifically. We also have people who are professional illustrators and even a doctor. He is a doctor in the daytime and at night he studies filmmaking (laughs). We take students from age 18, but we have people who are in their fifties. The majority are in their late twenties, though." The results of the school's labours so far have been encouraging: "There were two students who worked on the film Pulse which was directed by Kiyoshi Kurosawa," Hiroko Matsuda explains. "One as assistant director and the other in set design. It was mister Kurosawa who offered them these positions, because he felt they were talented and he liked them a lot from the previous time he worked with them. So this was not a decision made by the school at all. But one of our students is now a professional director. His name is Takashi Shimizu and he already directed three films, the latest one being Tomie Re-birth. He used to be an assistant director before he entered the school. He made a promotional video for the school, which was noticed by mister Kurosawa and Hiroshi Takahashi, the writer of Ring. Kurosawa-san then got Shimizu a job directing a making-of featurette for a film he made for television. The new film by Akihiko Shiota, entitled Harmful Insect (Gaichu), has a screenplay written by a student, Yayoi Kiyono." Matsumoto adds: "We founded the school in 1997, so there aren't so many graduates yet. But we are happy with the results so far. Something else we're glad about is that our teachers, like mister Kurosawa, mister Shiota and Kunitoshi Manda have been able to find the budgets for their films more easily than before." For its future plans, The Film School of Tokyo is looking beyond Japan's borders. Matsumoto: "We have plans to collaborate with foreign schools in the future. I'm currently researching the curriculum of film schools abroad with this in mind. We've had a number of people visiting us, like Bolivian director Jorge Sanjines, who has plans to start a similar film school in Latin America. Maybe we will have the opportunity to work together. Nelson Pereira Dos Santos visited us too. He teaches film at the Sao Paulo University in Brazil and we will keep in touch with him about possible collaboration." Matsumoto also sees opportunities to expand the school's horizons within Japan. "We would like to create one additional filmmaking course, since we only have two at the moment. We're thinking of starting a course on digital filmmaking and working with digital technology. But it's not good to only study the technical side of things, so we would like to focus on the creative side too and on how to express oneself using digital technology. Furthermore we're thinking of having classes in the daytime, specifically for older people. Maybe someone who is retired will only have the chance to make one movie in their life, but that one film might become something truly marvellous."